Troop “E” 7th Cavalry was deployed in skirmish line along the north side of a ravine from a pocket in which they were endeavoring to drive several Indians who were good shots and doing great injury to the men who were endeavoring to force them from the ravine. 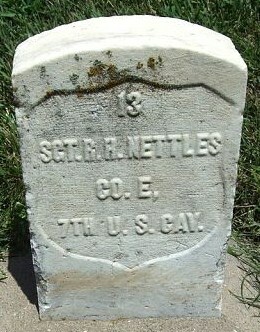 Sergeant Robert H. Nettles of Captain Ilsley’s E Troop was one of two soldiers from that unit killed at Wounded Knee. At thirty-eight years of age the native Irishman was near the end of his second five-year enlistment in the Army and had previously completed three years in the Navy. According to a casualty list published in the Omaha Daily Bee on New Years day, 1891, Nettles, like Private Kellner, was shot in the head, certainly while his troop was attempting to dislodge the Lakota that were firing effectively on the unit from covered and concealed positions in the ravine. History has most harshly criticized the 7th Cavalry for the exceptionally high loss of life of non-combatants at Wounded Knee, particularly in the pocket of the ravine. If given the opportunity, the veterans that fought along the skirmish lines of E Troop would testify–and several did–that those Lakota women and children that were grievously wounded or killed in the ravine were hit because the troopers could not distinguish them from the men, or because of their close proximity to the warriors that were firing on the troops, or because they themselves were returning fire. Major General Nelson A. Miles, perhaps the harshest critic of the 7th Cavalry, in or out of uniform, condemned the leadership of Major Whitside specifically because of his placement of the Indian village adjacent to the dry ravine, “in case they should take refuge in the ravine [and] cause a useless loss of life in dislodging them.” Sergeant Nettles’s head wound testified to the accuracy of the Lakota fire, and the cost to the regiment in extricating the Lakota from the pocket. 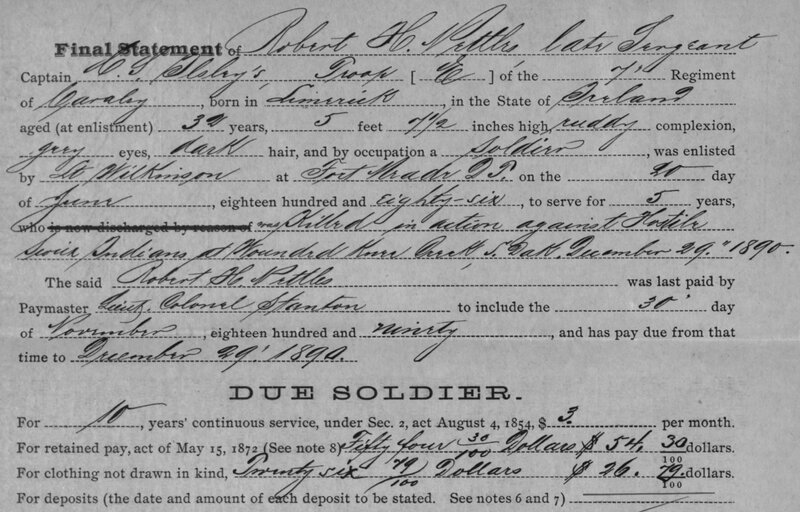 Sergeant Robert H. Nettles’s final statement made out by Captain C. S. Ilsley lists the soldier’s city of birth as Limerick, but at least one other enlistment record stated he was born in Cork, Ireland. Robert Nettles arrived in America with his mother aboard the S. S. Wyoming on 7 November 1871. Like so many of the soldiers of the frontier Army, little is recorded of the life of Robert H. Nettles. He was born about 1852 in either Cork or Limerick, Ireland–his Army records conflict on his native city. 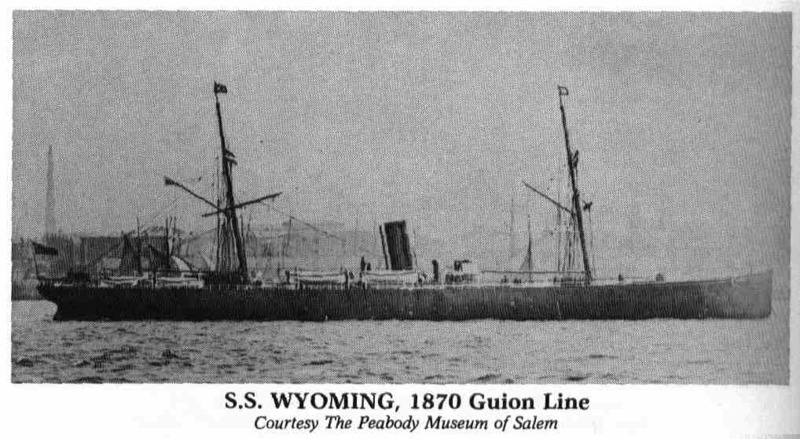 At the age of nineteen he and his thirty-six-year-old mother, Catherine A., boarded the S. S. Wyoming, a Guion line steamship, and sailed from Queensbury to New York Harbor. There is no record of who his father was or what his fate may have been. Mother and son established their residence in Boston, Massachusetts, where Catherine worked as a dressmaker. In less than a year of arriving in his new country, Nettles enlisted at the United States Naval Rendezvous at Boston in 1872 for a three year term. Stating that he was twenty-one years of age, Nettles stood five feet, seven inches, with blue eyes, brown hair, a fair complexion, and a scar on his forehead. Following his term in the Navy, Nettles returned to Boston and at the end of May 1876 enlisted in the Army, listing his previous occupation as a landsman–the lowest rank in the Navy at that time. He was discharged for medical reasons little more than three weeks later at Fort Columbus, New York. Having overcome whatever disability precluded his Army service in 1876, Nettles likely enlisted again in 1881, for he began his second five-year enlistment on 20 June 1886 at Fort Meade in the Dakota Territory. His records indicate it was his third enlistment, his only unit of assignment being E Troop, 7th Cavalry. Sergeant Nettles, like his fellow fallen comrades, was initially buried in the Pine Ridge cemetery next to the Episcopal church in grave number 13 on New Year’s Eve, 1890. Six months later Catherine Nettles filed for a pension for her only child’s service related death. She continued to reside in Boston where she boarded at 4 Tyler Street and later at 194 Harrison Avenue. Catherine died of meningitis on 21 July 1903. Sergeant Robert H. Nettles remain’s were removed from Pine Ridge and reburied at the Fort Riley Post Cemetery on 20 October 1906. Charles H. Cressey, Omaha Daily Bee, “The Death Roll,” 1 January 1891. Adjutant General’s Office, Medal of Honor file for Albert McMillan, Principal Record Division, file 3466, Record Group: 94, Stack area: 8W3, Row: 7, Compartment 30, Shelf: 2. Research conducted by Vonnie S. Zullo of The Horse Soldier Research Service. Alm Family Website, “Ole & Johanne Alm Immigrate” (http://www.mnwebsteps.com/alm/ole-imm.htm) accessed 7 Dec 2014. Ancestry.com, U.S., Naval Enlistment Rendezvous, 1855-1891 [database on-line] . ( Provo, UT, USA: Ancestry.com Operations, Inc., 2014), NARA Publication Number: M1953, NARA Roll: 41, FHL Film Number: 2383641; Ancestry.com and The Church of Jesus Christ of Latter-day Saints, 1880 United States Federal Census [database on-line] (Provo, UT, USA: Ancestry.com Operations Inc, 2010), Year: 1880, Census Place: Boston, Suffolk, Massachusetts, Roll: 555, Family History Film: 1254555, Page: 522A, Enumeration District: 655, Image: 0425. Ancestry.com, U.S. Army, Register of Enlistments, 1798-1914 [database on-line] (Provo, UT, USA: Ancestry.com Operations Inc, 2007), Time Period: 1871-1877, Alphabetical Listing: H-O, Image: 541, Line: 44, and Time Period: 1885-1890, Alphabetical Listing: L-Z, Image: 199, Line: 62. Ancestry.com, U.S. Military Burial Registers, 1768-1921 [database on-line] (Provo, UT, USA: Ancestry.com Operations Inc, 2007), Original data: Burial Registers for Military Posts, Camps, and Stations, 1768-1921, Microfilm Publication M2014, 1 roll, ARC ID: 4478153, Records of the Office of the Quartermaster General, Record Group 92, National Archives in Washington, D.C., State: South Dakota, Page#: 218; National Archives and Records Administration, U.S., Civil War Pension Index: General Index to Pension Files, 1861-1934 [database on-line] (Provo, UT, USA: Ancestry.com Operations Inc, 2000), State Filed: Massachusetts, Roll number: T288_347; Ancestry.com, U.S. City Directories, 1821-1989 [database on-line] (Provo, UT, USA: Ancestry.com Operations, Inc., 2011), Publication Title: Boston, Massachusetts, City Directory, 1894, Page: 1040; Ancestry.com, Massachusetts, Death Records, 1841-1915 [database on-line] “Deaths Registered in the City of Boston for the Year 1903,” (Provo, UT, USA: Ancestry.com Operations, Inc., 2013), Page: 383, No. : 6123. Jana Mitchell, photo., “Sgt Robert H Nettles,” FindAGrave, (http://www.findagrave.com/cgi-bin/fg.cgi?page=gr&GRid=59154179) accessed 7 Dec 2014. Citation for this article: Samuel L. Russell, “Irish Immigrant Sergeant Robert H. Nettles, E Troop, 7th Cavalry – Killed in Action,” Army at Wounded Knee (Sumter, SC: Russell Martial Research, 2013-2015, http://wp.me/p3NoJy-Di), posted 7 Dec 2014, accessed date __________. This entry was posted in Casualties, Enlisted and tagged 1890, 7th Cavalry, 7th Cavalry Regiment (United States), Battle of Wounded Knee, Cavalry, Fort Riley, Killed in Action, Lakota, Oglala Lakota, Pine Ridge, Pine Ridge Agency, Pine Ridge Indian Reservation, Sioux, Wounded Knee, Wounded Knee Creek, Wounded Knee Massacre. Bookmark the permalink. Ms. Carney… I am very interested in the letter, and anything else you may have concerning the Pine Ridge campaign. Ms. Carney kindly shared this letter with me. It is posted on this blog at Letter from Private Thomas McGuire, D Troop, 7th Cavalry.